FBI descends on home of pipe-bomb suspect. MSNBC is reporting that a suspect has been arrested in the foiled bombing of a Martin Luther King parade in Spokane, Wash., last January. 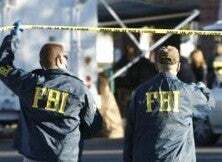 The article says that NBC station KHQ-TV of Spokane reported that FBI vehicles converged on a home located 75 miles outside of Spokane. It has been reported that one man was arrested and federal agents were preparing to search the house. The newspaper reported that the source said the man was believed to be affiliated with white supremacists. The Seattle Times said the U.S. Attorney's Office in Spokane was expected to release more details Wednesday. The bomb had a remote detonator and the ability to cause mass casualties, according to officials. It was defused without incident. The attempt raised the possibility of a racial motive in a region that has been home to the white-supremacist group Aryan Nations. Possibility? Folks kill me pretending that they don't know if something is a hate crime. Planting a bomb along the parade route celebrating the Rev. Martin Luther King Jr. pretty much suggests that it is. The act is unconscionable, and the possible result is unthinkable. Perhaps Rep. King should expand his terrorism investigation to include this area of the country where white supremacy is rampant. I would say planting a bomb along a parade route honoring Dr. King is not only a hate crime but also a terrorist act.